Struggling to choose between Sendible vs Hootsuite for your social media management? It’s a tough decision…and you’re certainly not alone if you’re not sure which service to pick. 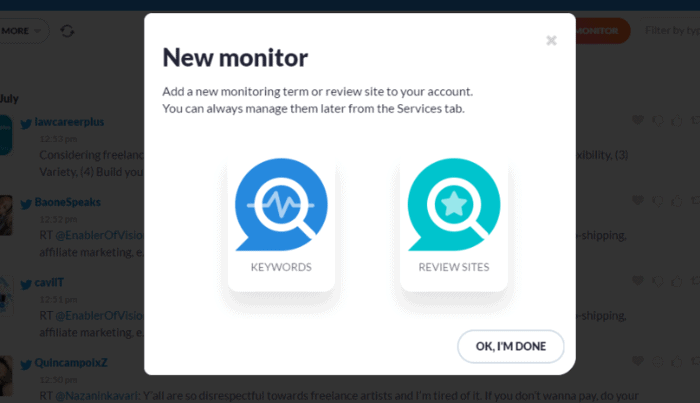 … to give you a better look at how each service approaches features like dashboards, scheduling posts and curating content, monitoring social media, creating reports, and pricing, too! 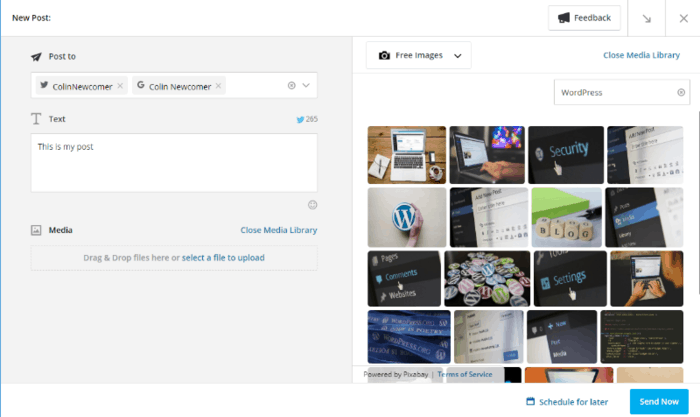 In general, I recommend Hootsuite for solo bloggers and Sendible for teams and agencies. But you might have specific needs that push you in one direction or the other. And after reading this whole post, I hope you understand why that is and have all the information that you need to make your decision. I just want to cover the high-level feature differences between Sendible and Hootsuite. Then, in the next several sections, I’ll actually go hands-on and take the comparison deeper. Please Note – for this comparison, I’m using the $84 per month Small plan for Sendible and the $99 per month Team plan for Hootsuite. I found this to be the fairest comparison, but you might have more/fewer features depending on which plan you choose. So you lose some sites like Blogger and Tumblr, but you gain support for Pinterest with Hootsuite. Both Sendible and Hootsuite include helpful core dashboards to help you manage most important actions from a single area. 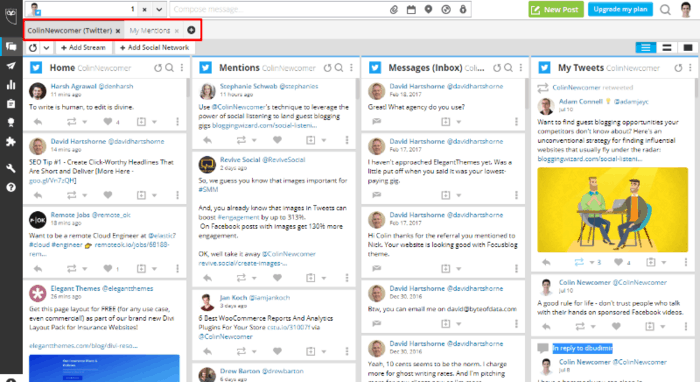 While both tools have some advantages, I prefer Hootsuite’s main dashboard because it gives you a little bit more flexibility (you’ll see why in a second). Sendible’s main dashboard is its Priority Inbox. The Priority Inbox tries to make your job easier by letting you see the most important information first. 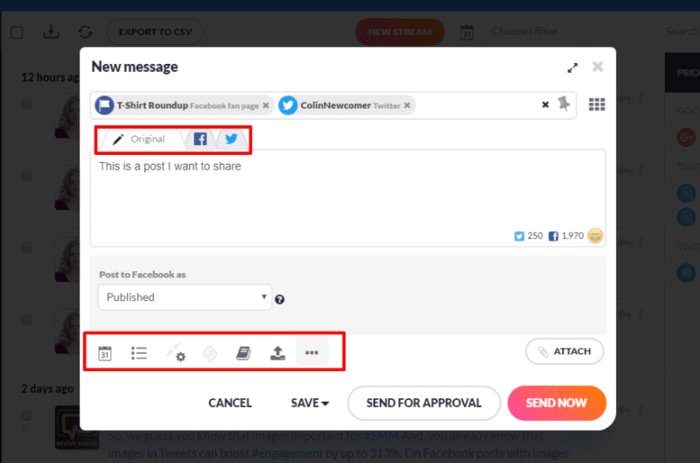 You can also use the options on the right to switch between different inboxes – like a specific Twitter keyword or all your mentions. I like the idea of a single Priority Inbox because it can save you time. 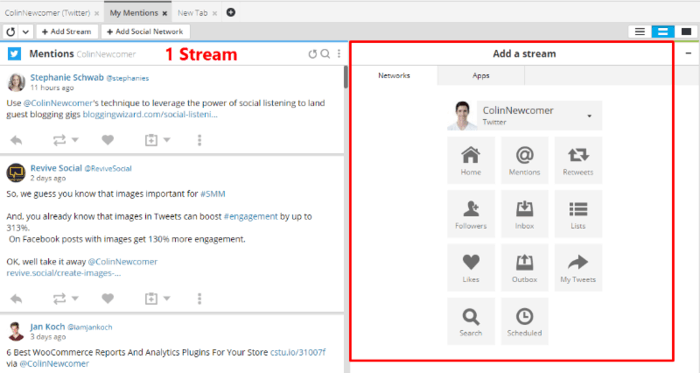 But if you prefer to monitor individual streams, you won’t find a ton of difference between Hootsuite and Sendible beyond the different layouts. Recommended Reading: How to get 500 Facebook likes (without ads) Over the weekend. What I find helpful about these tabs is that you can add multiple streams to a single tab, which I think lets you create a more customized dashboard. 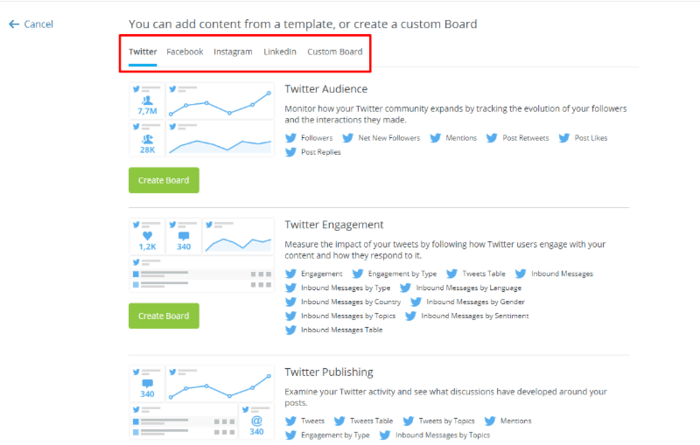 Both Sendible and Hootsuite include detailed functionality to help you schedule your content and curate content to share. With that being said, I find Sendible’s curation features to be a little stronger, especially on lower-tier plans (Hootsuite does have a great Content Library feature, but only on the super expensive Business/Enterprise plans). Additionally, Sendible has some neat time-saving features to help you share unique content on different networks. And in general, I prefer Sreendible’s post composer to Hootsuite’s. For those two reasons, I found Sendible to have a slightly better content creation experience. It’s easy to customize your message for each individual network by using the different tabs. Sendible will copy your Original message to each tab. Then, you just need to go in and add some customization, which is really convenient because you might not want to share identical content on every single network. If you’re working on a team, you can also send a post for approval before adding it to the schedule. Again, I found this content curation to be significantly stronger than Hootsuite, at least on Hootsuite’s Team tier. 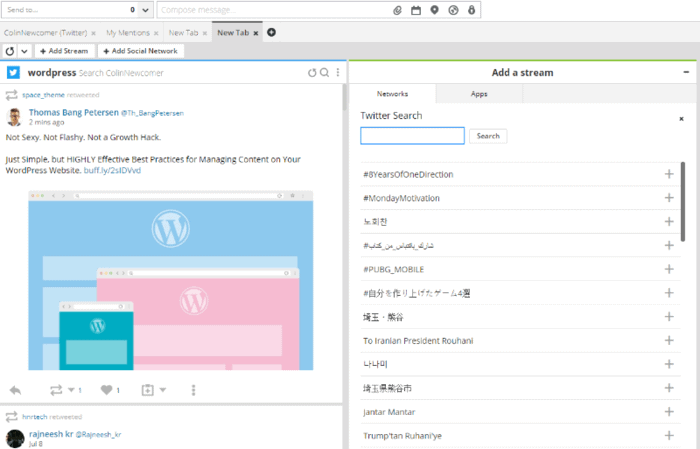 Hootsuite also offers a composer that you can access from anywhere. Additionally, the curation options on the Team plan are fairly limited. You can add your own RSS feeds. And you can also re-share content from your streams. But the most helpful curation feature – the content library – is only available on the Business or Enterprise plans, which start at a cool $599 per month. Sendible, on the other hand, includes the content library feature even on its cheapest plan. For that reason, Sendible has a much more accessible approach to content curation. 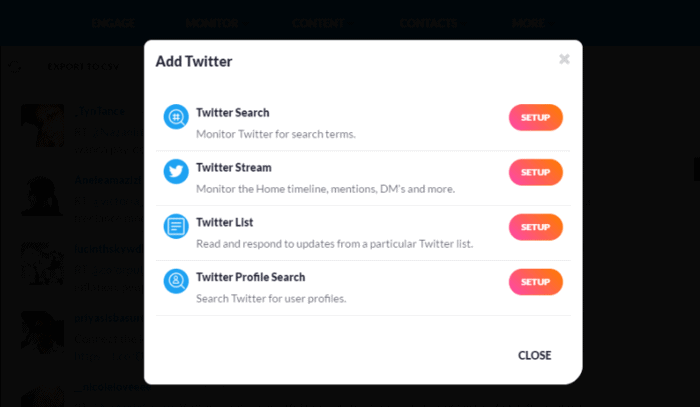 To help with social listening, Sendible includes a dedicated Monitor tab, whereas Hootsuite wraps it into its tabbed-interface that you saw before. Even with Sendible’s dedicated Monitor area, I still find Hootsuite’s tabbed approach to be more convenient for social listening. This helps because it lets you prioritize certain content – like paying special attention to negative mentions of your brand. 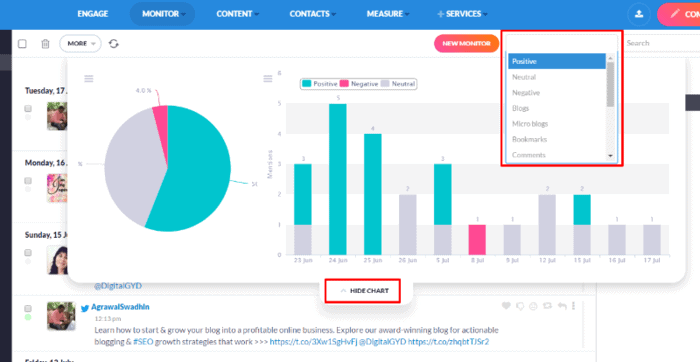 While Hootsuite includes basic sentiment filters and you can get sentiment analysis with Hootsuite, the reports are only in the separate Hootsuite Insights service, whereas Sendible gives you those reports in the core product for no added cost. The latter is useful, but only for businesses that will receive reviews. Most people will probably rely on the Keyword monitoring, which is quite detailed. You can also interact directly with any post, or assign it to another team member to deal with. The option to monitor review sites, which is especially helpful for services or local businesses. 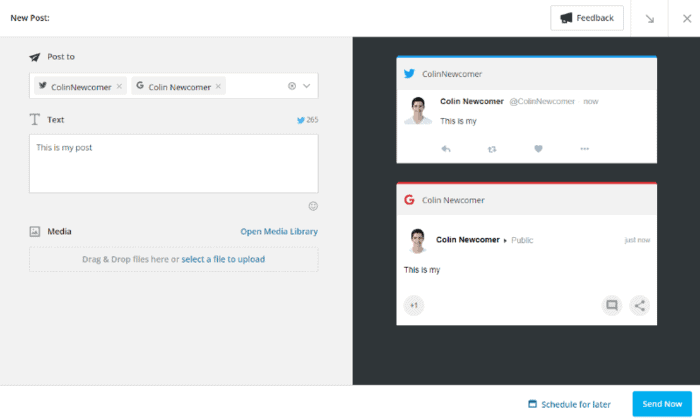 For example, you can set up a stream for any mention of “WordPress” on Twitter. 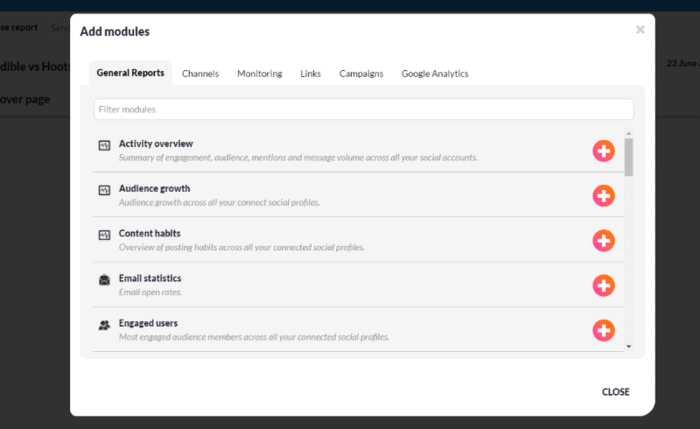 Both Sendible and Hootsuite offer detailed reporting and analytics options. 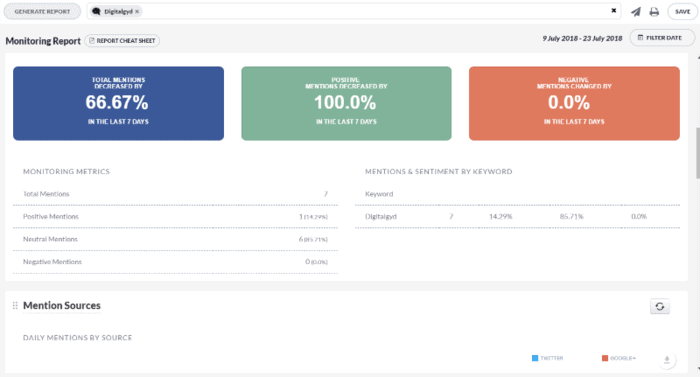 Currently, Hootsuite doesn’t let you white-label reports for your clients, whereas Sendible makes it easy to create your own white-labeled reports. In its Measure tab, Sendible includes a variety of pre-built reports, as well as a Report Builder tool to help you create your own reports. And again – if you’re working with clients, one of Sendible’s big differentiators is the option to white-label the reports that you create with your own logo and information. While Hootsuite lacks white-labeling, I found its reports interface quite easy to use and think it’s a great option for solo users. When you create a custom board, you use a simple widget system to add the information that you want to display. 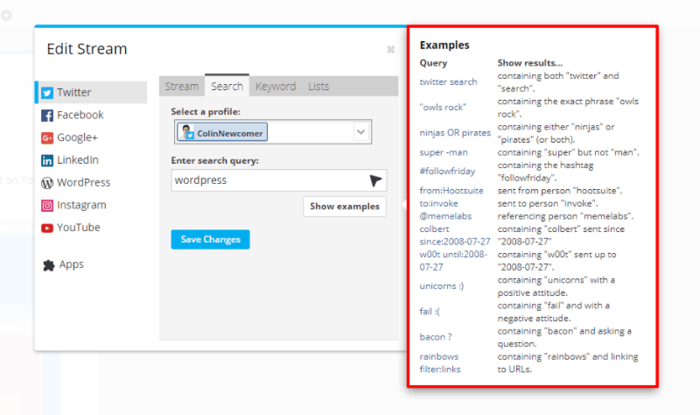 I found Hootsuite’s reports interface easier to use – I just wish they would add an option for white-labeling. Depending on your needs, each service can come out a little cheaper. In general, Hootsuite is more affordable for solopreneurs and bloggers, whereas Sendible can be the cheaper option for teams or agencies. Hootsuite charges per “social profile”. For example, one Twitter account is always one social profile. Sendible charges per “service”. A service is “an interaction with any social network account”. Depending on what your exact needs are, you may need to use multiple services for a single social account. This isn’t inherently a bad thing because it can work to your advantage in some situations. But it’s important to remember when looking at the different plans. For all these prices, I’m referring to annual billing. On the lowest tier, Hootsuite is a little more accessible with plans starting at just $19 per month for 10 social profiles. Sendible’s cheapest tier is $24 per month for 12 services. The difference isn’t huge – but that’s an extra $60 per year for Sendible. 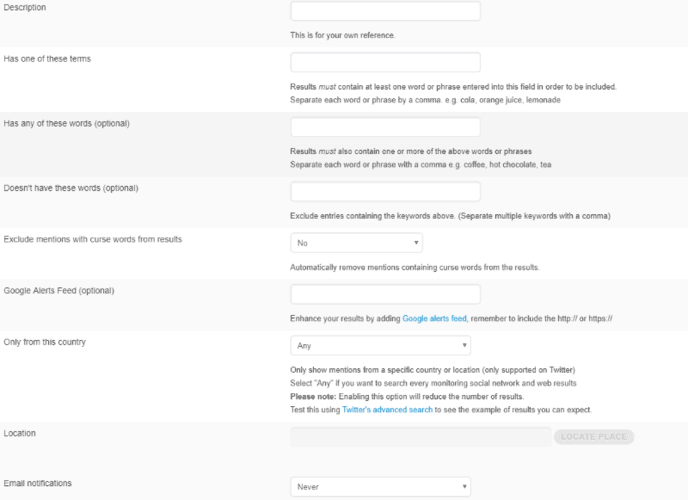 Hootsuite also has a limited free plan that supports 3 social profiles and 30 scheduled messages. 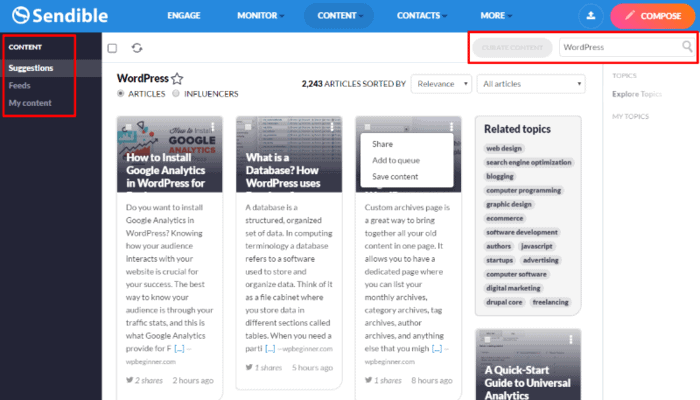 Sendible doesn’t have any free plan, which is another thing that makes Hootsuite a better option for bloggers on a budget. On the first team tier, Sendible is actually a little bit more affordable, coming in at $84 per month for 48 services, compared to Hootsuite’s $99 per month for 20 social profiles. Both of those plans support 3 users. If you jump up to the next enterprise/agency tier, Hootsuite costs a whopping $599 per month for 35 profiles and a bevy of new features, whereas Sendible has two plans for $199 per month (105 services) or $299 per month (192 services). 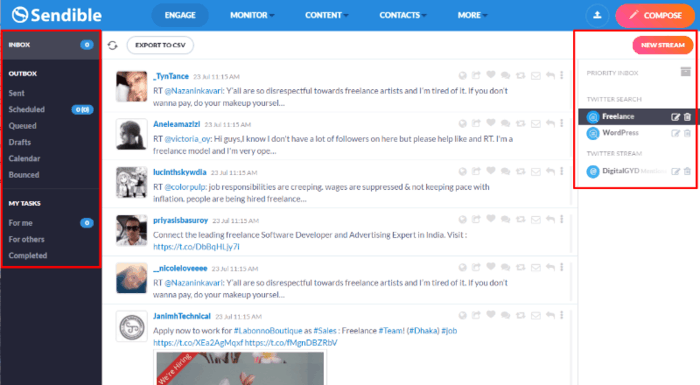 Hootsuite is probably more affordable for bloggers or solo users. Sendible will likely be more affordable for larger teams or agencies. 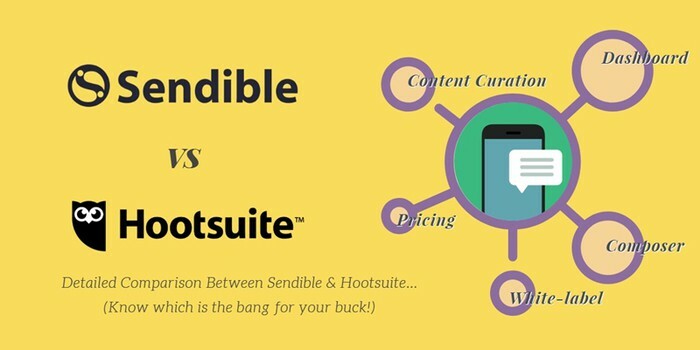 Should You Choose Sendible or Hootsuite? As you can probably guess, there’s no one-size-fits-all approach and each service has its own pros and cons. A top-class composer tool that makes it really easy to customize your content, even for different networks. I found it superior to Hootsuite’s. Better content curation, especially on lower-tier plans. More affordable plans for agencies and teams. White-labeled reports, which is something Hootsuite lacks. Better approach to its dashboard…at least in my opinion. I love the tabbed approach and the ability to add multiple streams to each tab. Free plan, as well as a more affordable plan for solo bloggers. Slightly more user-friendly reports interface. If you just want to monitor or schedule posts for lots of different accounts (but not both), Sendible might be a better deal. If you want to monitor and schedule posts, Hootsuite might be a bit cheaper. Sendible to be a great option for teams and agencies because of its great composer tool, affordability, and white-labeling. Hootsuite to be the option for solo bloggers and individuals because it’s more affordable on that tier, has a free plan to get you started, and is a bit more user-friendly (at least in my opinion). Both tools offer a 30-day free trial, so you can get started without any risk and find out which one you prefer! Now over to you – have you used both of these tools? If so which, would one do you recommend and why? Excellent, thorough review of these 2 great services. If you’re ready to pay for social media management services, these are both great options. Very helpful that you broke down the comparisons in such detail.